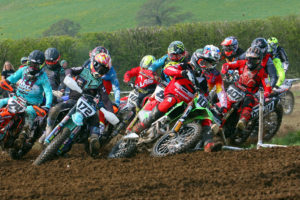 Gorgeous Springtime weather at last showed up for the riders and racers at the WES 2019 -round 2 at Maeshfn in Mold, North Wales last weekend as a full schedule of racing and a very busy weekend of action unfolded. The Maeshafn venue is a stalwart of the WOR Events arsenal of courses and tracks and has indeed over 2 decades of history of enduro events, it’s a great place and on a nice day one of the most picturesque places in the off-road motorcycle world. Last weekend a very healthy turn out of riders attended this famous venue for the racing on offer. WOR Events ran 3 races in the day, starting at 8.30am with the Auto Enduro class, aimed at the little kids on Auto’s or semi Auto’s in a 1hr stand alone special race that had Rd 1 winner, Ceri Williams take another start to finish winning performance and gather another valuable 20 points towards his championship. Runner Up was Curtis McAloon with Curtis Mealham in a sold 3rd place. All of the Auto riders doing really well navigating the technical and bumpy North Wales mountainside. The Bigger kids race then started at 10am running for 1.5hrs and having a much bigger and challenging lap ahead of them. A big turn out saw the top placing go to Lewis Hurdsman in the 11/12 yrs Category as he topped his class and the overall, good news for the local youngster as he had suffered a snapped chain at rd 1 whilst in the lead. Following Lewis home as the Runner Up in class was Rd 1 Winner, Jayden Westcott and Alfie Barber took 3rd spot. Westcott matched Hurdsmans’ 22 laps and was indeed 2nd overall in the whole race, its certainly going to be a battle this year with those guys. In the 13/14’s It was Billy Austin ahead of Ollie Harley and Ryan Maudsley in 2nd and 3rd spot respectively. Austin was on 21 laps as was Harley with Maudsley on 20 circuits. The impressive talent of Young Jayden Jones on his #199 machine completed 20 laps and won the 9/10 yrs group, very impressive seeing as he missed lap one due to a late start line appearance … Jones was runaway winner from deserved Runner Up, William Barnett on his YAMAHA and Dylan Tinker plugged away for a solid 3rd place and 15 championship points. The 7/8 group was won by the flying Jack Brooks, really enjoying the drier terrain and showing his form on his little 65 Husky. Brooks staved off the strong challenge from Rd 1 7/8 winner, Gruff Morgan by a lap and time with 3rd placed George Sheldon going well on 14 laps and as always giving full effort. A nice presentation for the kids awards and results took place and then the WOR track team had done some course modifications and opened the big 5 mile per lap, adult track. A very demanding, twisty, and technical track that offered the riders a real mix of new, old and freshened up going on a course that would certainly tire out the riders and racers. Dry conditions made for perfect terrain underfoot with lovely berms and peaty tracks and lots of rock splattered climbs and drop off’s in the mix. 12.30 PM for a 2.5hr Hare and Hounds Enduro was the format set for the adults in all classes in this Rd 2 of the WES 2019. GASGAS rider Gethin Humphreys made it 4 out of 4 win in a row at WOR as he blasted the bright Red and White 300 2t Machine to the chequered flag honours. Gethin had to chase down his Brother Owain though as he was first lap leader and looking very strong on his 350f. The brothers swapped the lead a couple of times and it was a crash by Owain on the downhill to lap scoring with an hour to go that handed the batton over to Gethin at the front and a dnf for Owain, Gethin was not too look back and stormed forward with a race winning margin of nearly 3 and half minutes over Runner Up, Yamaha Mounted Jack Ditchfield , who did look fast out on the track indeed, both riders completing 15 laps each. 3rd place went to Jamie Dilworth with a solid and speedy performance to take final top-class honours. The recently introduced Expert B class was topped by Paul Engerlen with his usual consistency and speed as he scored 14 laps and led home Runner Up, Sion Jones and 3rd placed Liam Bellfield whom were also on 14 laps each after 2.5hrs of hard battle. Tim Forman on his Beta 2t was in blistering form and his relentless speed and determination was for all to see as he clawed his way through the pack to take the Expert Vets class win and a fine 3rd place overall on 15 laps. Runner Up was the ever improving and speedy, Darren Skillin. Darren looking well worth his 14 laps after his swap from 4t to 2t machinery. 3rd place went to Lincoln Brewster (4t 250) after a superb show of his old speed and pace had him leading the class and up there with the Humphreys boys early on and making Tim Forman play catch up, a few bike gremlins seemed to pop up though and this eventually slowed him down and forced an unhappy 3rd place on the upset Brewster. The Top two Clubman riders did enough to have been on the Expert B podium and may think about a move up should their superb form continue. Neil Roberts and Iuean Brooks where both on 14 laps and would have been 1st and 3rd in the Exp B’s … Good going from those men especially Roberts as he was 4 minutes clear and nearly half a lap ahead of Brooks. Third place Clubman was Young Sion Hughes fully deserving the podium and indeed leading the group early on. Just 18 seconds was Over 40 winner Jason Clarkes winning margin over ERS suspension Guru, Andy Jervis,” Jerv” is an old school WORC competitor and it was nice to see him back in action and indeed taking a podium place. 3rd spot was Titus Blackwell’s as he scored good points to add to his rd 1 victory. Over 50’s was Chris Wagstaff’s as he again placed his Trusty Yamaha at the front of this competitive group of riders. No one is more competitive than Colin Griffiths in the Runners up spot as he was only 37 seconds adrift of Waggy with both on 13 laps, at 60 years of age Griffiths is an inspiration to the Younger riders blasting round and one hell of an example to try and follow. 3rd spot in the Over 50’s went to the always consistent, Mark Plain whom was 5 minutes off the Runner’s up pace. A very youthful Sportsman class podium showed a sign of how the Clubman class will look soon. Young Haydn Tyrer was top dog with Max Eillidge only 1 minute and 2 seconds behind as Runner Up with 3rd Placed Hayden Rainford a further 1 minute and 18 seconds down with all 3 on 13 laps. The combined age of the Sportsman podium riders was 46 years of age …Great things happening for the youth riders there. Glesni Jones was back on form after a knock out a few months back and took the ladies class on 12 laps from Runner Up, Brooklyne Johnson and 3rd placed Lola Stacey – Jones. Top Youth Rider was the super smooth and quick Sam Hughes, Hughes taking off where he left Rd 1 as the winner .. Runner Up was Frank Skillin, only a minute and 20 down on Hughes and getting a good run of form and luck in at the moment which is good to see. 3rd spot in Youth went to Cameron Games with a solid and determined ride to a trophy placing and 15 valuable series points. The Novice class was topped by James Short on a score that would have put him 3rd place in the Sportsman, more form like that and the likeable Short will be proudly promoted up a group. Runner Up was Richard Jones with Darren Stephenson in a solid 3rd place. The WES 2019 is certainly gaining momentum and the friendly, welcoming, yet professional and purposeful atmosphere of the racing and the events as a whole is certainly dragging in the off road motorcyclists, young and old to come and get their kicks with the vastly experienced WOR Events team, with the some of the best venues in the UK and one of the best marshalling and safety teams out there, riders are knowing they get what they pay their hard earned for..
WOR as always wish to send a massive thank you out to all involved in the running of these events from the medics and caterers through to the landowners, sponsors, media folk and most importantly the riders and their families for coming out in massive numbers to support the events and races.